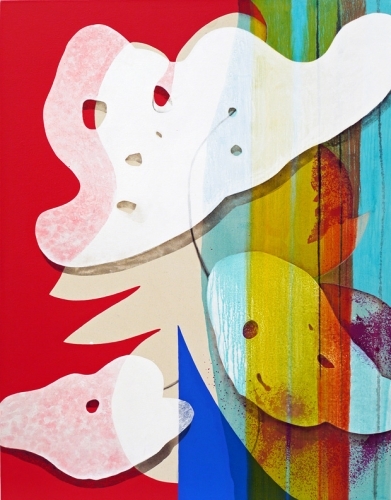 Carrie Moyer in "The Humanism of Abstraction"
The three artists in this exhibition–Carrie Moyer, David Reed, and John Zinsser–are prominent abstract painters who in very different but vital ways continue the tradition of abstract painting. In addition to their common concerns with color, shape, and surface texture, each creates abstract imagery that powerfully evokes a world of human feeling–and a kind of radiant humanism. They were invited to show in this exhibition because of the quality of their work and the continuity that they represent between Abstract Expressionism and contemporary abstraction. All three artists were also participants in a symposium about the legacy of Robert Motherwell at the Archives of American Art in Washington, D.C., in December 2015.